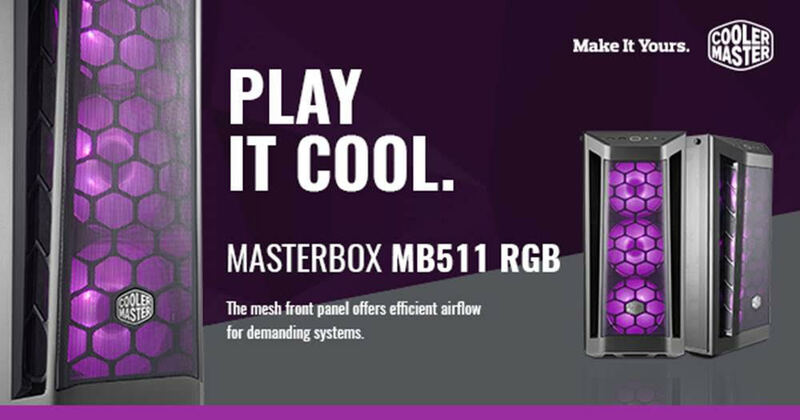 SINGAPORE – Cooler Master launches the MasterBox MB511 RGB. This version includes 3 pre-installed RGB fans, RGB lighting control, and a tempered-glass panel for a lighting system that is available as soon as the case is unboxed. Systems built for high demand gaming can breathe easy through the mesh front panel. Along with the aggressive intakes in front, there is also ventilation on top for added thermal support. Mesh Front Panel – Offers efficient airflow for demanding systems with the mesh front panel. Performance Intake – Large intakes on each side of the front panel pay tribute to high performance cars. RGB LED Fans – Three 120mm RGB LED fans in front are pre-installed to create an amazing lighting effect. RGB Lighting Control – One RGB controller is included in the accessory pack. If your MB does not support the RGB control function, you can connect the RESET button and control the RGB lighting directly from the I/O panel. Certified compatible with: ASUS, Gigabyte, MSI and ASRock motherboards. Fans & Cooling Support – Support for a total of six 120mm fans, front, top and rear radiator placement ensures that you don’t have to compromise on performance. Graphics Card Support up to 410mm – You won’t ever have to worry about the fit of your graphics card with support for even the largest, widest cards. Edge-to-Edge Tempered Glass Side Panel – Showcase your build and system lighting effect through 4mm-thick tempered glass side panel. The side panel bracket hinges at an angle during removal, while two “captive” screws are held in place with rubber so they are not misplaced. SSD Bracket – Mount an extra SSD on the PSU shroud for more storage. Out-of-the-box lighting is paired with a black-coated frame and PSU shroud to set the stage for the system configuration. To neatly display the system, an ample amount of space is provided to route cables. The SSD mounts, found behind the motherboard, are friction mounts. Without tools, four pegs are installed on the SSD and simply placed into the rubber holes, this will secure the SSD to keep it from moving even while the case is transported. Building a gaming rig is a process that evolves in components over time. To align with the pace of technology, interior clearances have ample space to support future component upgrades. The chassis and PSU shroud are powder-coated in black to help compliment your build while the tempered glass side panel shows it off. The MasterBox MB511 RGB is now available in Singapore, priced at SGD 119.